Under physiological conditions, CXCL12 modulates cell proliferation, survival, angiogenesis, and migration mainly through CXCR4. Interestingly, the newly discovered receptor CXCR7 for CXCL12 is highly expressed in many tumor cells as well as tumor-associated blood vessels, although the level of CXCR7 in normal blood cells is low. Recently, many studies have suggested that CXCR7 promotes cell growth and metastasis in various cancers, including lymphoma and leukemia, hepatocecullar, ovarian, colorectal, breast and lung cancer. Compared to CXCR4, CXCR7 is a non-classical GPCR that is unable to activate G proteins. The function of CXCR7 is generally considered to be mediated by: (a) recruiting β-arrestin-2; (b) heterodimerizing with CXCR4; and (c) acting as a “scavenger” of CXCL12, thus lowering the level of CXCL12 to weaken the activity of CXCR4. However, the crosstalk between CXCL12/CXCR7/CXCR4 and other signaling pathways (such as the p38 MAPK pathway, the PI3K/mTOR pathway, the STAT3 signaling, and metalloproteinases MMP-9 and MMP-2) is more complicated. The function of CXCR7 is also involved in modulating tumor microenvironment, tumor cell migration and apoptosis. 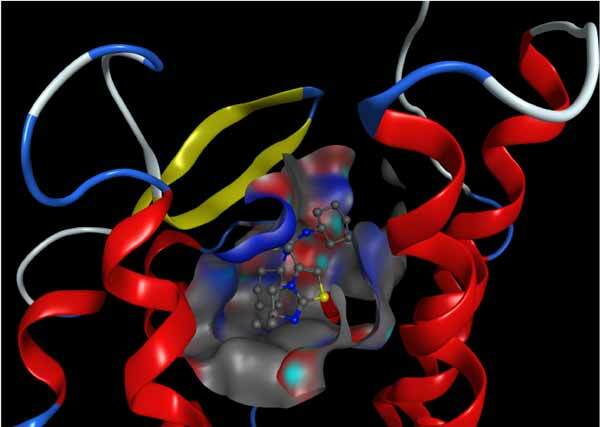 Understanding these complex interactions will provide insight in drug design targeting the CXCR7 as potential anticancer therapy. CXCL12, SDF, Migration, Apoptosis, Angiogenesis, Chemokine, Metastasis, Cancer stem cell, AMD3100, CCX771, CXCR4, CXCR7, β-arrestin, Antagonist and agonist.